I have a life of good intentions. This represents another one of those. Once my knees were sufficiently strengthened, I was going to get back into walking for exercise. It was going to be a few blocks building up to a few miles. 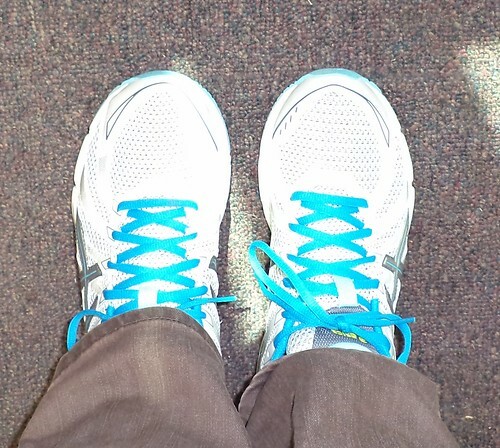 I even bought new walking shoes. That was in May. Here it is August and I hadn't taken the shoes out of their original box. The highly considered walking program became another grand idea consigned to the 'maybe' pile. After looking at the box on the table in the living room I finally decided that these shoes were meant to be worn and although the idea was to use them only for walking and not errands or work, if I didn't actually wear them, they would sit on the table indefinitely. There was a reason I bought these. It's not just my hands and knees that have problems with RA. My feet do, as well. About 8 years ago, I started having cramps in my toes, particularly of my left foot. I had custom shoe inserts made which helped for a couple of years. But they were designed specifically for one shoe and I wear multiple kinds of shoes during a week, giving a pair a 'rest' between wearings. Now that I have RA, my toes can cramp unexpectedly and I find that when I have to be on my feet for extended periods of time, I need support in the ball of the foot. My toes need cushioning a lot more than the rest of the foot does. I must have tried on 15 different kinds of shoes before coming back to these. They were also on sale. A well-fitting pair of shoes energizes you. I came home after a day of wearing these around the office thinking I could, perhaps, get a walking program going after work. But then I got involved in another project and it got to be too late in the evening. Oh well. At least I'll look good in spite of not following through with my best of intentions.